◦All analog circuitry. ◦Easy to use. Patented ergonomic design with the control knobs facing you. 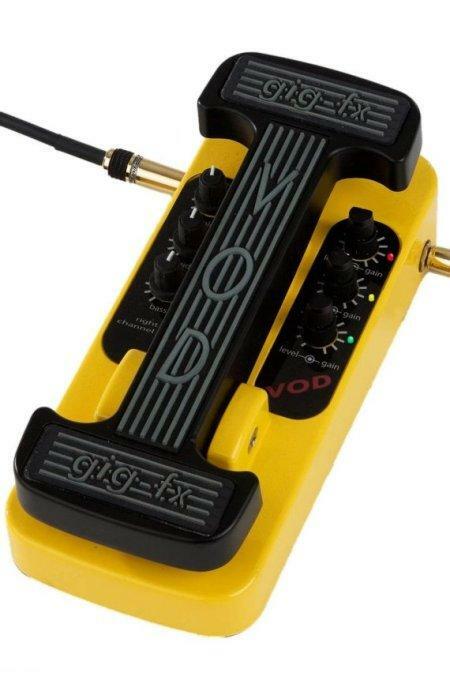 The unique pedal shape allows more controls in a smaller footprint. ◦Reliable, wear-free, noise-free, pop-free optical operation. Bypassed when the pedal is all the way back (heel down). ◦9V operating voltage, 15mA current consumption. ◦Will accept standard 2.1mm 9VAC adapter supply plug, center negative. Adapter jack has protection diode to protect the pedal from an incorrect polarity should it occur. ◦Bright Green, Amber and Red LEDs to show effect is on and exactly which stage is engaged. Compact Size: 9” x 4” (228mm x 103mm). ◦Lightweight, high-quality aircraft aluminum casting and rugged construction, only 2.3lbs (1.1kg). ◦CE, RoHS, FCC compliant.